BRIGHT IDEAS STEM FROM TODAY’S YOUTH! Do you have what it takes to create the next big idea? Is your creative genius aspiring to unfold? Bright House Networks is proud to present Bright Ideas STEM from Today’s Youth, a multi-state competition where high school students dream up the coolest inventions to make their own life, community or even the world, more awesome… and show how STEM – that’s science, technology, engineering and math, can bring their idea to life. The new Bright Ideas STEM from Today’s Youth program will award one student (or team of students) the opportunity to work with a lead innovation firm – which means this student’s dream or idea could potentially be realized and fulfilled! 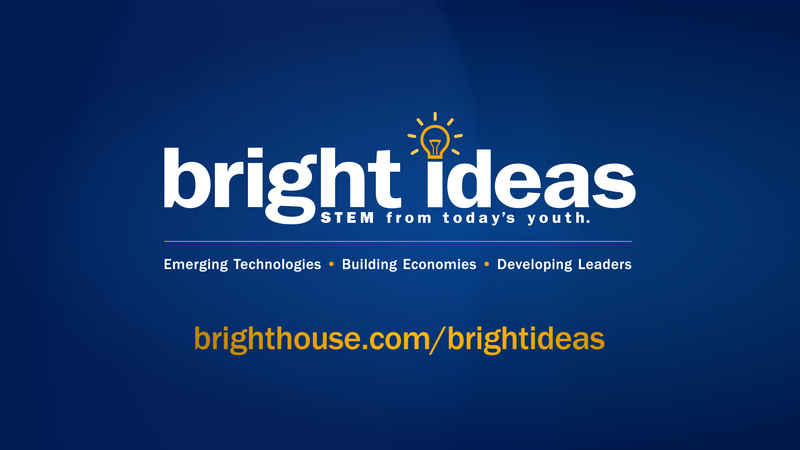 Bright Ideas STEM from Today’s Youth is open to all high school students who are at least 14years old as of the date of entry and who attend a public, private or parochial high school within a Bright House Networks service area. Students will be able to compete as individuals or as part of a team. Teams who enter will be required to assign an ownership stake (from 1 to 100%) to each team member for the entry submitted. What will students win? Six lucky finalists will be chosen, one from each of Bright House Networks service areas. These students will travel to Orlando, Fla., where they will compete head-to-head on TV, in front of a studio audience. The program will be recorded and available via Video on Demand (VOD) on Bright House Networks. the chance to work with lead innovation firm Fahrenheit 212 in New York to build a virtual prototype and a business plan. Bright House Networks is welcoming the help of local businesses, nonprofits or individuals who have an education, entrepreneurship or innovation background for the new program. To find out how you can get involved or to register for program updates, e-mail BHNBrightIdeas@mybrighthouse.com. To access the most up-to-date information visit www.brighthouse.com/brightideas. More information is available online about all of Bright House Networks educational initiatives, including its Future Leaders Scholarship program and Classroom Innovators Grant program at http://www.brighthouse.com/service area/about/community. More information is available about Bright House Networks or our products and services, visit brighthouse.com.